As sentinels of the immune system, dendritic cells (DCs) are naturally located in all tissues, especially those at the interface between the body and the external environment, like skin, lung, and intestine. They are also in lymphoid organs where they activate T cells, initiating immune responses. Due to limited access to human solid tissues, most of studies of DCs from lymphoid and non-lymphoid organs have been performed on tissues obtained ex vivo from mouse models. Many markers and functions of myeloid cells, such as expression of MHC class II, CD11c, CD11b, and antigen presentation, are shared among different myeloid cell types such that the classification and identification of myeloid cell remains an evolving subject in the scientific community. Moreover, cell subsets and markers are not always consistent between mice and humans leading to debate over the correspondence of mouse and human subsets. The latest classification defines 3 mouse DC subsets in lymphoid organs, which have counterparts in human blood: plasmacytoid DC (pDC) and the 2 conventional or myeloid DCs (cDC) subsets cDC1s and cDC2s. Plasmacytoid DCs (pDC) are primary located in blood and lymphoid tissues. They depend on the E2-2 transcription factor and express B220, Siglec-H, mPDCA-1 (CD317 or Bst2), as well as intermediate levels of MHC class II, CD11c and costimulatory molecules. pDCs are poor stimulators of T helper cells, but upon stimulation with bacterial DNA containing particular unmethylated CpG motifs or upon viral challenge, they produce large amounts of type I IFN and acquire antigen-presenting capacity (PMID: 16172135, 15728491). Conventional DC 1 (cDC1) are located in both lymphoid and non-lymphoid tissues, and express higher levels of MHC class II and CD11c compared to pDCs. They show dependence on Batf3 transcriptional factor and are characterized by different sets of markers depending on their location, origin, and function. Resident spleen and lymph node cDC1s express CD8a, XCR1, and CD24. When cDC1s migrate from non-lymphoid tissue to a draining lymph node, they are distinguished from resident cDCs by markers expressed in the periphery, such as CD103, by activation molecules, and by higher levels of MHC class II and lower levels of CD11c. However, when resident cDCs are activated during inflammation, these markers cannot be used to discriminate migratory and resident cDCs. cDC1s recognize intracellular pathogens and start type 1 immune responses including ILC1, NK cells and T helper cell 1 skewing. Moreover, cDC1s efficiently cross-present extracellular antigens to CD8+ T cell and secrete IL-12, making them important for cytotoxic response to viral infections and tumors (PMID: 23516985). Conventional DC 2 (cDC2) exhibit the same MHC class II and CD11c expression pattern as cDC1s, but express markers not present on cDC1s and depend on a different transcription factor, IRF4. Resident spleen and lymph node cDC2s express CD4 and SIRPα. Migratory cDC2s infiltrating lymph nodes can be distinguished from resident cDCs under non-inflammatory conditions by the expression of MHC class II, CD11c, and peripheral and migratory markers (e.g., CCR7 and maturation markers). cDC2s induce different responses, such as activation of ILC2s and TH2 cells against parasites and during asthma, and induction of ILC3s and TH17 immune responses to extracellular bacteria (PMID: 27760337). Miltenyi Biotec has created dedicated application protocols for working with mouse DCs. Research on mouse DCs is hampered by difficulties in isolating viable cells from solid tissues in numbers that allow comprehensive downstream investigation, such as flow cytometry analysis, cell sorting, and transcriptional studies. One critical aspect is the reliable dissociation of tissues, yielding cells with high viability and epitope integrity. Enzymatic and mechanical dissociation of spleen is necessary for high recovery of DCs, which are trapped in connective tissues and are inadequately released by simple mechanical meshing (PMID: 23516985). The Spleen Dissociation Kit, mouse in combination with gentleMACS™ Octo Dissociator with Heaters enables efficient, automated, and hands-free enzymatic and mechanical digestion of several spleens in parallel. Both cell recovery and epitope preservation are high. For more details, see corresponding spleen chapter. Miltenyi Biotec has developed numerous products for the straightforward magnetic separation of DCs cells and distinct DC subsets. DCs constitutively express the hematopoietic surface markers CD45, MHC class II, Flt3, and CD11c, and lack T cell, natural killer (NK) cell, B cell, granulocyte, and erythrocyte lineage markers (PMID: 23516985). In mice, CD11c is a well-established, yet not exclusive DC marker. Pan DCs can be positively enriched from spleen using the CD11c MicroBeads UltraPure, mouse or isolated by depletion of non-target cells using the Pan Dendritic Cell Isolation Kit, mouse. Subset populations can be further enriched with a second separation step using MicroBeads or via flow sorting. Isolation of total, untouched DCs. Pan DCs were isolated from a mouse spleen cell suspension using the Pan Dendritic Cell Isolation Kit, mouse, an LS Column, and a MidiMACS™ Separator. The cells were fluorescently stained with CD11c-APC and mPDCA-1-FITC and analyzed by flow cytometry using the MACSQuant® Analyzer. Cell debris, dead cells and lineage positive cells were excluded from the analysis based on scatter signals, propidium iodide fluorescence and lineage antigen expression. The cDC2 subset of DCs co-express CD11c, CD11b, MHC class II, CD40, CD80, CD86 and are negative for CD8 and CD205. They represent the major population of DCs in spleen (56 % of all CD11c+ cells) and comprise only a small population in peripheral lymph nodes (4 % of all CD11c+ DCs). The CD4+ Dendritic Cell Isolation Kit, mouse isolates CD4+ cells from an enriched CD sample, after depletion of non-DC cells. Two-step isolation of CD4+ DCs from a mouse spleen. A spleen cell suspension was processed using the CD4+ Dendritic Cell Isolation Kit, mouse, an LD and two MS Columns, a MidiMACS and a MiniMACS Separator. In the past, studies of cDC1s were hampered by cell scarcity and lack of specific cell surface markers. However, the receptors Clec9A and XCR1 have been recently identified as specific markers for cross-presenting cDCs in lymphoid and non-lymphoid tissue. The Anti-XCR1 MicroBead Kit (Spleen), mouse represents a novel method for the fast and easy isolation of cross-presenting DCs, that allows routine enrichment of XCR1+ DCs with high recovery and purity, without pre-depletion of non-target cells or laborious cell sorting. Fast isolation of cross-presenting DCs from mouse spleen. XCR1+ DCs were isolated from a spleen single-cell suspension using the Anti-XCR1 MicroBead Kit (Spleen) with two MS Columns and a MiniMACS™ Separator. Cells were fluorescently stained with Anti-MHC Class II-VioGreen™, CD11c-VioBlue®,Anti-XCR1-PE and CD8a-APC and analyzed using the MACSQuant Analyzer 10. Cell debris, dead cells, and autofluorescent cells were excluded from the analysis based on scatter and propidium iodide fluorescence. The dot plots on the right show conventional DCs gated on CD11c+MHC class II+ cells, stained for cross-presenting DC markers (CD8a and XCR1). Plasmacytoid dendritic cells can be isolated from spleen by positive selection using the Anti mPDCA-1 MicroBeads, mouse or by depletion of unwanted cells with the Plasmacytoid Dendritic Cell Isolation Kit, mouse, which was designed for the rapid enrichment of pDCs. Depletion of non-target cells generates a highly enriched population of pDCs. pDCs were isolated from splenocytes using the Plasmacytoid Dendritic Cell Isolation Kit, a MidiMACS Separator, and an LS Column. Cells were fluorescently stained with Anti-mPDCA-1-FITC and Anti-Siglec-H-PE and analyzed by flow cytometry on the MACSQuant Analyzer. Cell debris and dead cells were excluded from the analysis based on scatter signals and propidium iodide fluorescence. Phenotyping or enriching DCs via surface markers can be challenging because several myeloid cells share similar markers, and different DC subsets can strongly modify their surface marker expression depending on their location and activation status. Furthermore, enzymatic tissue digestion can affect surface epitopes. Optimization of antibodies with a specific and consistent enzyme cocktail is important to avoid false negative staining that compromises the identification of specific DC subsets. DCs can be cultured in vitro and stimulated via antigen or toll-like receptor (TLR) ligand presentation. Antigen targeting of antigen-presenting cells via specific receptors has been used to induce effective antigen-specific cell (APC) responses and thus, characterize the function of new receptors on APCs and compare these with well-known receptors. The Ova Antigen Delivery Module Set was developed for in vitro targeting of ovalbumin to APCs like DCs. The Set includes all reagents needed for the isolation of DCs, for antigen delivery, and for subsequent analysis of antigen presentation. Toll-like receptors (TLR) recognize highly conserved structural motifs of a wide variety of ligands expressed exclusively by microbial pathogens, called pathogen-associated molecular patterns (PAMPs). This function is part of an early innate immune response. TLR 7 and 8 are involved in responses to viral infection and recognize single-stranded RNAs as their natural ligand, as well as small synthetic molecules. TLR 7 is expressed on murine myeloid dendritic cells and monocytes, while TLR 8 is functionally impaired in mice. The TLR7/8 Agonists ORN R-0006, ORN R-2336, ORN RNA 40, and ORN R-2176-dT activate murine TLR7 and induce secretion of a broad spectrum of cytokines, including IFN-α, IFN-γ, IL-12 and TNF-α. Murine bone marrow-derived dendritic cells (BM-DCs) are generated from bone marrow progenitor cells by culturing a total cell suspension from mouse bone-marrow with specific cytokines. For example, BM-DCs that resemble conventional DCs can be generated using granulocyte/macrophage colony-stimulating factor (GM-CSF) alone, or GM-CSF in conjunction with interleukin-4 (IL-4). Alternatively, pDC can be generated using Flt3-Ligand. These culture methods generate high numbers of DCs, but also result in heterogeneous DC populations. Each dendritic cell subset resident in spleen and lymph nodes (pDC, cDC1, and cDC2) has a corresponding subset in non-lymphoid tissues that shares the same ontogeny and presents similar but not identical phenotype (PMID: 23516985). This peripheral phenotype, plus certain markers of activation, often allows to distinguish counterpart cells migrating into non-inflamed lymphoid tissues. The complexity of DC phenotyping makes it essential that all epitopes needed to identify subsets are preserved during tissue digestion. Miltenyi Biotec offers optimized kits for the dissociation of tissues and preparation of single-cell suspensions from several tissues, including lamina propria, lung, and skin in combination with the gentleMACS™ Octo Dissociator with Heaters. The CD11c MicroBeads UltraPure, mouse are optimized for the rapid and simple isolation of mouse DCs from single-cell suspensions of lymphoid and non-lymphoid tissues, such as lung and lamina propria. These MicroBeads greatly improve recovery and purity of the sorted population by specifically enriching viable cells. Langerhans cells are best enriched with the Epidermal Langerhans Cell MicroBead Kit, mouse. Langerhans cells isolated from a mouse epidermis single-cell suspension. A single-cell suspension was prepared using the Epidermis Dissociation Kit, mouse. The Epidermal Langerhans Cell MicroBead Kit, one MS Column, and a MiniMACS Separator were used to isolate the Langerhans cells, which were fluorescently stained with CD207 and CD11c and analyzed by flow cytometry on the MACSQuant Analyzer. Cell debris and dead cells were excluded from the analysis based on scatter signals and propidium iodide fluorescence. For a comprehensive analysis of DCs in non-lymphoid tissues, expand the list of markers described for the characterization of DCs from lymphoid tissue (see 2.5. Characterization of DCs from lymphoid tissue by flow cytometry) with markers such as CD64 and F4/80 that should be negative in lymphoid counterpart subsets. Flow cytometry analysis of DCs from spleen, lung and lamina propria. Mouse spleens, lungs, and small intestines were dissociated with gentleMACS Octo Dissociator with Heaters and the respective MACS Tissue Dissociation Kit. (A) Dissociated cells were stained with the specified antibodies and analyzed by flow cytometry using Flowlogic software. Cells were gated on the PI– population. (B) Enrichment of pan DCs and CD11c+ macrophage populations was done with CD11c MicroBeads Ultrapure, mouse. Enriched cells were stained with the specified antibodies and analyzed by flow cytometry. Cells were gated on the PI– population. Flow cytometry analysis of DCs from spleen, lung and lamina propria. Mouse spleens, lungs, and small intestines were dissociated with gentleMACS Octo Dissociator with Heaters and the respective MACS Tissue Dissociation Kit. 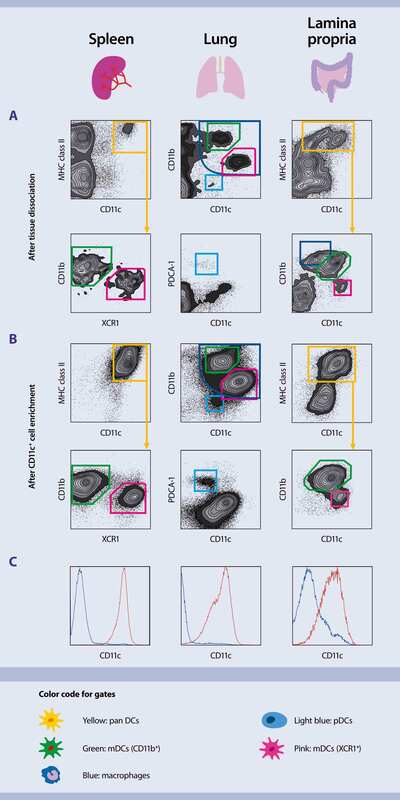 (A) Dissociated cells were stained with the specified antibodies and analyzed by flow cytometry using Flowlogic software. Cells were gated on the PI– population. (B) Enrichment of pan DCs and CD11c+ macrophage populations was done with CD11c MicroBeads Ultrapure, mouse. Enriched cells were stained with the specified antibodies and analyzed by flow cytometry. Cells were gated on the PI– population.